Planning Commission Chair Robert Morris is "outraged" at the county planning staff's draft ordinance. A new outdoor medical marijuana draft ordinance has been released in advance of next week’s board of supervisors meeting, and it contains the stiffer restrictions on canopy sizes and cultivation in timber lands that supervisors have asked for since their review began at the beginning of the year. It’s a turn away from some of the supervisors’ original reactions to an October draft, as well as a reversal of the direction the planning commission took with the ordinance, which was decidedly more grower-friendly. The board will discuss the draft Jan. 19, and, if supervisors follow staff recommendations, it will be set for adoption on Jan. 26, giving it barely enough time to pass before the current March 1 deadline after which the county would have to cede local medical marijuana control to the state. The supervisors’ limits, as the Journal has reported, are a strategy to align the ordinance with its associated mitigated negative declaration, a document that prevents the board from conducting a lengthy environmental review. The mitigated negative declaration was based on that of the state water board’s environmental program from last year, and, after the planning commission finished its review of the ordinance, planning staff warned that the commission’s changes would negate the declaration. Environmental groups all but threatened to sue, which would’ve sunk the effort to enact the ordinance by March 1. The supervisors’ general concurrence with the staff is sure to be rankling the planning commission, which, at its Jan. 7 meeting — the first since staff consolidated the commission’s 10-meeting endurance run — expressed outrage at the staff report. 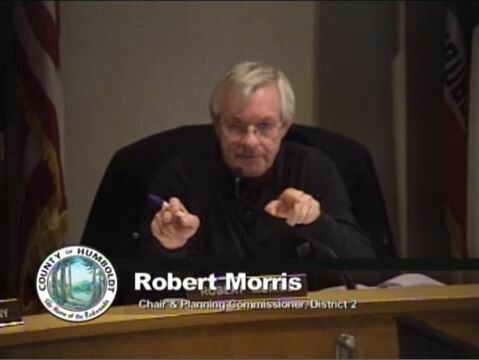 Though the move would have had “no binding force or effect,” in the words of Commissioner Lee Ulansey, he and Chair Robert Morris tried really, really, really hard to raise their hands and say they had no confidence in the county’s planning and building department. This, despite the fact that the subject appeared nowhere on the meeting’s agenda. At the end of the meeting, Morris raised concerns over the report, saying the topic of the draft’s adherence to the mitigated negative declaration was brought up multiple times during the commission review. Commissioner Ben Shepherd said he was disappointed to read in the staff report that the commission's direction on timber production zones was determined by staff to be out of line with the general plan. He would’ve liked to know that before it was submitted to the supervisors, he said. Commissioners Kevin McKenny and Alan Bongio also expressed disappointment in the draft submitted to supervisors, but the board has mostly been in agreement over even the more controversial points since they've been reviewing it. Sundberg, apparently the last holdout over the prohibition of new grows on timber production zones, acquiesced on Tuesday, and the board voted unanimously to include the restriction. This prompted Shepherd to weigh in, saying he was uncomfortable taking any kind of vote on an item that wasn’t on the agenda, citing the author of California’s public meeting law. “I think we’re kind of trouncing all over Ralph M. Brown here,” he said, adding later that he thought the planning staff in question deserved to be present to respond to the commission’s allegations. But Morris and Ulansey — despite their own previous championship of transparency laws — persisted. “I did not hear the counselor say that we were in violation of the Ralph M. Brown act,” Morris said. Ulansey suggested that the hands-raising was simply a straw-vote — routine for the commission to gauge support — but commissioner Noah Levy also expressed concern, saying he wasn’t aware of the commission taking a straw vote on an item that wasn’t on the agenda. Eventually, Morris gave in. “The purpose for my question for the raise of hands was to figure out if it was a significant issue to agendize,” he said. The commissioners seemed to agree that, after 30 minutes of discussing the issue, yes, it was worth discussing. The commission will take up the planning staff’s report as an agenda item at the Jan. 21 meeting.